Baldomero Almada — “Melo” or (to Americans) “Mel” — was the first native Mexican ever to play in the majors. Almada was born in Huatabampo in the state of Sonora on February 7, 1913, but he grew up in Los Angeles from an early age. On September 8, 1933, less than two months after a heavily Mexican crowd celebrated their favorite on “Melo Almada Day” at L.A.’s Wrigley Field, the outfielder debuted with the Boston Red Sox. He went on to bat .284 in 646 games with the Sox, Senators, Browns, and Brooklyn Dodgers across seven big-league seasons. Though Almada lacked power, he was a good contact hitter and base-stealer. He often led off, with a batting style that appears similar to Ichiro Suzuki’s many years later. Tommy Holmes, writing from Brooklyn in the July 6, 1939 Sporting News, called him the “most pronounced ‘water bucket’ hitter in the majors. You never saw a guy in such a hurry to keep a date at first base. He seems to be running towards the initial hassock even before his bat meets the ball.” Alas, Mel Almada never won a batting crown ... despite his noble conquistador blood. Baldomero Almada Quirós, who was named for his father, traced his paternal ancestry back centuries to Iberia. Washington sportswriter Shirley Povich recounted this history in the May 15, 1938 Washington Post. Don Álvaro Váz de Almada died in the 1449 battle of Alfarrobeira serving Don Pedro, the rebellious regent of Portugal — but not before being knighted in London by King Henry VI of England and designated Count of Abranches by King Charles III of France. One of Don Álvaro’s forebears, Don Antonio Vásquez de Almada, had served with valor in the battle of Aljubarrotta more than 200 years earlier, routing the Spanish from Portugal. And that’s not to mention Don Ruy Fernández de Almada, Don Cristóbal de Almada, Don Francisco de Almada, and Don Antonio, who fought to restore Portugal’s independence and became King John IV’s ambassador to England. There were several other Dons of note, and some Doñas as well. In Povich’s account, it was Mel’s great-great-grandfather, Don José María, who laid down the silver bars. The story delves into legend in several places, offering such tales as the 52 legitimate children fathered by Don José María and the time he fired an enemy’s pistol into his own chest to prove he was unafraid. A later Almada was said to have buried strongboxes of silver at various locations on his vast lands but was struck with cholera and died, unable to reveal the locations where the silver had been hidden. Melo told Harry Edwards of the American League Service Bureau that his father “decided his family would prefer the glorious climate of Los Angeles to the excitement of trying to oust the governor who refused to be ousted.” Several Almadas were killed by warring factions and it seemed like a good time to serve elsewhere. Baldomero was offered the position of Ambassador to France, but didn’t want to travel that far from his homeland. The consulate in New York would probably be too cold in the winters, he thought. He finally took the post of consul in Los Angeles. At one point, he also served for a stretch as commercial attaché in San Francisco for the Mexican government. Their father had become a passionate baseball fan and encouraged his sons to play the game. They attended Jefferson Grammar School, John Adams Junior High, and Los Angeles High School.Lou Almada played outfield for nine full years in the Pacific Coast League, spending 1929 through 1937 with Seattle and the Mission Reds. He turned pro with Albany of the Eastern League in 1927, the year before he joined the PCL, as a New York Giants pitching prospect. Lou won his only decision, leaving him with an undefeated 1-0 pro record (he made very brief appearances as a pitcher in three other seasons). It must have been quite a game. Lou gave up 16 hits, walking two and striking out one. He might well have become the first Mexican big-leaguer that year. However, he was injured by a line drive off the bat of Fred Lindstrom during batting practice in spring training. Author Gilberto Garcia notes that Lou later got homesick and bolted Albany for home. When City League baseball began in May 1930, L.A. High coach Herbert White gave the left-handed Almada the starting assignment. The Romans beat their archrivals from Polytechnic, 8-1, holding them to five hits; Melo contributed both a single and a home run in the team’s five-run sixth inning. Mel pitched throughout high school and played outfield. He also played American Legion ball with the William Lane Junior Legion Post and for a semipro team in the area named the El Pasos. Louis — also known as “Ladies Day Lou” for his success on those occasions — cost himself his job with Seattle in 1932. There was a good deal of publicity about the talented pair of brothers, both of whom had starred on the mound for L.A. High. Lou thought to bring Melo to Santa Cruz, where the Seattle team trained. The Times’ Bob Ray told readers back in Los Angeles that “Melo got a job with the Tribe and Louie, who was looking for a better salary package, was given the gate. Fortunately for Louie, though, he caught on with the Missions.” [Los Angeles Times, May 2, 1932] Louis was released in April [The Sporting News June 7, 1934]. Though originally intended as a utility outfielder, Melo played in 127 games for Seattle, hitting .311 in 438 at-bats, with six home runs. Those of Almada’s hometown fans arriving even a minute late for the start of the September 5 doubleheader missed out — he hit the first pitch of the game for a long home run. The Times writer honored Melo with a bit of melodramatic prose: “Many of the fans were still standing, but the concussion from this blow staggered them into their respective reserved seats, stupefied if not actually stunned.” [Los Angeles Times, September 6, 1932] Mel also stole 28 bases. [The Sporting News, December 21, 1933] Louis did even better with the bat in 1932, hitting .320 for the San Francisco Missions. Even in March 1933, Melo was being touted as perhaps the “best young outfield prospect” in the Coast League. [The Sporting News, March 23, 1933] He started the season strongly. Playing left field again with Seattle, he led off with a double and hit safely four more times for a 5-for-5 day on April 8 in L.A. He had four-hit games on May 7, June 10, and June 20 as well, and a 17-game hitting streak from May 28 to June 11. Under a headline VIVA ALMADA!, it was already being predicted that the 20-year-old would be sold to a major league club before the season was out. The Sox left Almada with Seattle for further seasoning. Meanwhile, Muller fizzled out quickly. He debuted on July 8, but only got into 15 games, made five errors, hit zero home runs, and batted just .188. After two 1934 at-bats without a hit, his days in the major leagues were complete. On July 23, “Melo Almada Day” at Wrigley Field took place. Mexican consul Alejandro V. Martínez and Rosita Moreno, the “beautiful Mexican screen actress of the Fox studios,” presented him with a gold baseball. A photograph of Moreno and Almada was headlined “Thees for You, Senor”. [Los Angeles Times, July 24, 1933] The golden ball was a gift from what the paper called the “Mexican colony of Angeles”. Boxers Kid Azteca and Baby Face Casanova also made appearances. 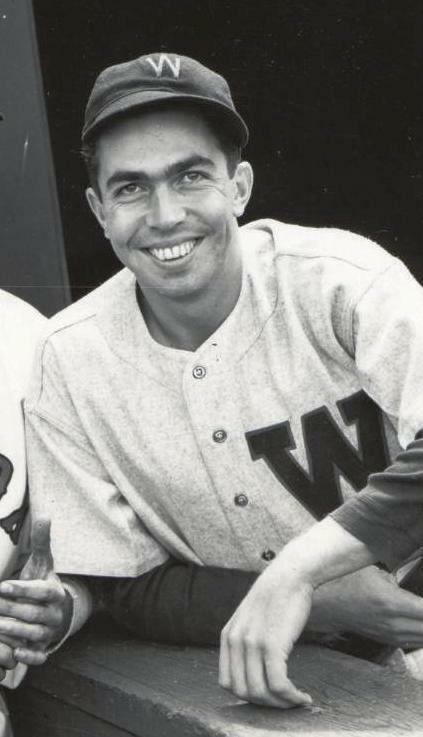 Bob Ray wrote of Almada’s tribute, “He’s a dandy chap and deserves it.” Almada was 2-for-7 on the day, but Seattle lost both games to the Hollywood Sheiks. Almada made his big-league debut on September 8, 1933. He played center field and led off in both games of a Fenway doubleheader against Detroit, going 1-for-4 in each game. He hit his only home run of his first season off New York’s Herb Pennock on September 23. Mel had replaced Smead Jolley during a 16-12 slugfest, and he scored three of Boston’s dozen runs. The left-handed outfielder batted .341 in 14 games before the end of the season, with three RBIs. He played a few games at first base as well, plus left field in an exhibition game against the Braves near the end of the month. It was a sign of the era in which he played that Collier’s described him as a “radio nut” and said “He even carries a portable radio with him on baseball trips, plugging it into his hotel room and listening to the programs.” One of the reasons he finished with such a good average was that he batted against Babe Ruth in the last game the Babe ever pitched, the October 1 game that ended the season. In Yankee Stadium, Ruth gave up 12 hits — 25% of them to Almada, who drove in one run. But Ruth also homered and earned the win in the 6-5 game. At the time of his debut, the Los Angeles Times had noted that Almada was the third Mexican ballplayer to play in the major leagues. The prior two were born in the United States. One fact the newspaper did not note: all three played for the Boston Red Sox. The Sox had previously fielded pitchers Frank Arellanes and Charley Hall (who pitched for the Red Sox from 1909 through 1913). Would that the Red Sox had pioneered in the signing of African American ballplayers as well! Lou Almada had made the PCL All-Star team, but was seeking more money. He almost quit the Missions to take an offer to teach baseball and coach in Mexico City, but perhaps things worked out better for him. In any event, he elected to stay and hit very well, batting .332. He played excellent ball, made the All-Star team and won the club’s MVP award over the course of 135 games, thanks in good part to his .328 average and 30 stolen bases. Near the end of the year, Boston (under manager Bucky Harris) recalled Mel, and he drove in another 10 runs. The “Spaniard” had two of the three hits the Sox mustered against Detroit’s Elden Auker on September 10. The “Spanish recruit” (again, the Atlanta Constitution) singled and scored the lone run in the September 12 1-0 win against the Tigers. After his first 36 games, he’d only committed one error in the field. Mel stuck with the big league team, missing just three games all year — and truly starred in a May 16 exhibition game in Syracuse. The Sox beat the Chiefs, 10-6, largely on the strength of Almada’s two-run double in the sixth and grand slam in the seventh. He impressed throughout the early going; in fact, The Sporting News praised him to the rooftops in its May 30 issue: “Mel Almada, now justly regarded as the greatest outfielder Boston has known since the days of the renowned Tris Speaker, is constantly confirming predictions that he will be one of the real stars of the season.” Mel’s .290 mark included three homers and 59 RBIs, plus nine triples, and he stole 20 bases. After the season, he played some Winter League ball in the L.A. area, where he lived with his parents. The Sox added Heinie Manush in 1936 and he won about the same playing time as Almada and Dusty Cooke (all had 300-odd at-bats). Doc Cramer was the only true regular. It was a deeper outfield, but Mel's hitting dropped off, first in spring training — which gave Cooke an early leg up — and then again later in the season. Manager Joe Cronin sat Mel down in September, with Jimmie Foxx taking over for some 16 games in the outfield. The club was a bit fractious, as temperamental Wes Ferrell was fined and Billy Werber clashed with Cronin more than once. Mel hit one homer and drove in 21. In the winter, he played some more ball in Los Angeles and also spent some time hunting deer in northern Mexico. Manush was released near the end of the ’36 season, and Cooke spent 1937 with Minneapolis. Buster Mills joined Cramer as a regular outfielder; Fabian Gaffke got most of the replacement work, but Dom Dallessandro and Almada did their parts as well. The Red Sox — who’d featured the only Danish-born big-leaguer, Olaf Henriksen, from 1911-17 — were cosmopolitan for the time. At points that season, their roster included Almada (who spoke Spanish), Gaffke (German), Dallesandro (Italian), and Gene Desautels (French). Multilingual catcher Moe Berg could converse with each. Mel played out 1937 with the Senators and really boosted his batting: he’d been hitting .236 for Boston, but hit .309 for Washington over the final 100 games. Though he helped the Senators snap a Yankees winning streak on July 2 with a four-hit game, his standout day was the July 25 doubleheader in St. Louis. Mel scored four runs in the first game and five in the second; overall, he was 6-for-9 at the plate, with a home run in the first game and a double in both. The downside was his two errors in the first game, but Washington swept the twin bill, 16-10 and 15-5. West was hitting .309 and had hit .328 the year before. The Browns knew he was 10 years older, and felt Almada was a better fit for their needs. The change of scenery seemed to help once more. Mel batted .342 for the Browns, helped considerably by a 29-game hitting streak. His total of 197 base hits set a mark for Mexican big-leaguers that would not be surpassed until 1998, when Vinny Castilla got 206 for the Colorado Rockies. Only George McQuinn hit as well for St. Louis in 1938. Washington was satisfied with Sammy West, too. It was one of those trades that worked out for both parties. Melo claimed that his hitting streak was broken during the season “because John Hanley, Browns' clubhouse attendant, failed to bring his daily letter from his loved one back in California.” [Casper, “Melo of Mexico”, Baseball, December 1938] The romance bloomed, though, and after the season was over, Melo departed quickly south of the border and on October 30 he married the former Alicia Terminel in Navojoa, Sonora. [Los Angeles Times, November 1, 1938]In 1939, for the third year in a row, Almada was moved in mid-June. St. Louis sold him to the Brooklyn Dodgers for $25,000. This time Mel’s average went down instead of up, from .239 to .214. He didn’t seem to have it anymore. It hadn’t started out that way — he earned a subhead “ALMADA STARS” in the March 6 Atlanta Constitution; the Associated Press saw him as a “strong contender for the regular centerfield post” with the Dodgers. Though he was still only 26 years old, Mel Almada’s career in the majors had ended. Despite his solid .284 lifetime average, his lack of power (.367 slugging percentage) was his biggest drawback. He’d driven in 197 runs but scored 363. He always had a good arm in the outfield and racked up 47 assists. Mel then returned home to southern California — but he wasn’t quite done playing. First he appealed to Commissioner Landis, asking that he be declared a free agent so he could have a shot at signing with another major league team. Landis asked the Dodgers to offer him on waivers again, but after no one claimed him, his contract became Rochester property. The Red Wings worked out a deal with the Sacramento Solons, and Almada officially came on option to the PCL club on May 15. He didn’t do well, batting .232 in 306 at-bats with just a pair of homers. The next year, Almada played as a pro in his native Mexico for the only time. He served as player-manager for Unión Laguna (Torreón), going .343-0-18 in 26 games. However, he gave up the post and quit playing on May 16. Among other things, Almada had difficulty controlling hard-hitting — and hard-drinking — third baseman Roy “El Indio” Arkeketa, an Oklahoman from the Ponca tribe. Headhunting by opposing pitchers may also have helped drive him from the league, suggested his friend and teammate, pitcher-outfielder Manolo Fortes. Mexican author Dr. Jaime Cervantes Pérez interviewed the Cuban, then aged 90, in 2004. Fortes recalled that the black players in the Mexican League hated Melo because he had played in the major leagues. In addition, Fortes described Almada as “un hombre alto blanco” — or “high white,” not only depicting the man but also implying resentment of his station in society. The beanballs began in Monterrey and spread from there; Almada asked the front office to step down, and Fortes was informed that he was the new manager. After organized baseball, he still picked up a bat once in a while; a March 23, 1942 snippet in the L. A. Times noted that he drove across the lone run in 1-0 win for the Arcadia Merchants over the Kenna Dome Wildcats. Semipro ball was never going to cover expenses, though. He worked in the produce business for some time, but — still being young — served in the U. S. Army during World War II. He joined the Army Medical Corps in 1944, training at Camp Barkeley in Texas. During 1945, Almada played for the Fort Sam Houston Rangers ball team in the San Antonio Service League. He batted .303 and also pitched and won five games for the Rangers. Some years after the war, Almada spent two-plus winters as manager of the Navojoa Mayos, a Sonora-based entry in the Mexican Pacific Coast League. According to the Enciclopedia del Béisbol Mexicano, Melo was in charge for the 1953-54 and 1955-56 seasons, plus part of 1956-57. Mel Almada died of a heart ailment on August 13, 1988 in Caborca, Sonora. Brother Lou survived him until 2005. Mel is still remembered in Mexico; even today its Pacific League awards the Baldomero Almada trophy to its rookie of the year. Thanks to Peter Mancuso and Rob Neyer for providing articles from Baseball, and to Rory Costello for quite a few hits in the late innings, uncovering additional information during his peer review. Email communications with Eddie Almada, March 2009. Pérez Quirós de Urrea, Petra and Roxana Hutchinson de Pérez-Quirós. “Pérez-Quirós Family” (http://www.geocities.com/genbuff2002/Page9.html). Garcia, Gilberto. “Beisboleros: Latin Americans and Baseball in the Northwest, 1914-1937.” Columbia magazine, Fall 2002.